Before you go up and down your attic stairs please make sure they are safe. 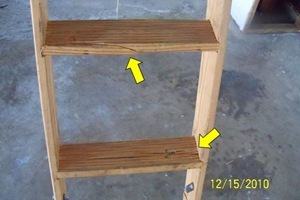 Dallas Home Inspector, Chris Goggans, found these two broken steps while inspecting this home. These steps won’t hold up to the average Americans weight, and then you add boxes, Christmas trees, and all the other items we store in our attics! If your stairs are broken many times they can be repaired, yet more often than not is it best to just have the entire ladder replaced. We just did in our home and we put in an aluminum ladder and boy do I fell much safer going up and down with my Christmas decorations. Have a Safe Christmas Season. Chris and Katie Goggans, Realty Inspection Services.